There is always plenty to see and do at Crich Tramway Village. You may have a keen interest in trams, transport or history or may just be looking for a unique place to visit, whatever your interest there is lots to see, explore and discover and the village makes an ideal family day out in the heart of Derbyshire. Trams run to and fro every few minutes as visitors ride over the cobbles of our period street, past the original facades of historic buildings from the around the country before heading up the valley to views that will take your breath away. Hand over the old penny you are given on entry and you are free to ride the trams all day. 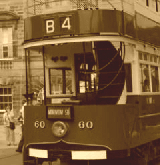 The Museums Tramcar fleet consists of over 70 historic vehicles, which illustrate the development and evolution of the British Tramcar. The large majority of the collection can be seen here at the Museum either on display in the Great Exhibition Hall and in the depots, being worked on in the Workshop or carrying visitors up and down our mile long track. A number of vehicles from the collection are also on loan to other museums/locations or in storage awaiting restoration. 14th - 22nd February Daily 10.30am - 4.00pm Weekends from 28th February until 4th April 10.30am - 4.00pm 4th April - November Daily 10.00am - 5.30pm.